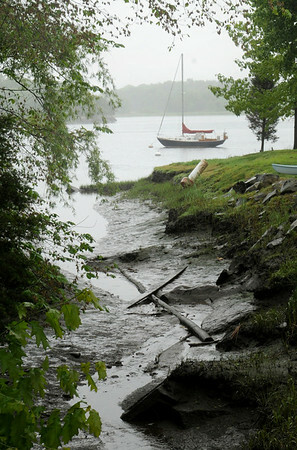 Amesbury: Light mist enshrouds a sailboat anchored off Old Merrill Street on the Merrimack River in Amesbury Thursday morning as light rain lessened into mist. The weather improves the weekend for boating and other outdoor activities. Bryan Eaton/Staff Photo Newburyport News Thursday May 28, 2009.